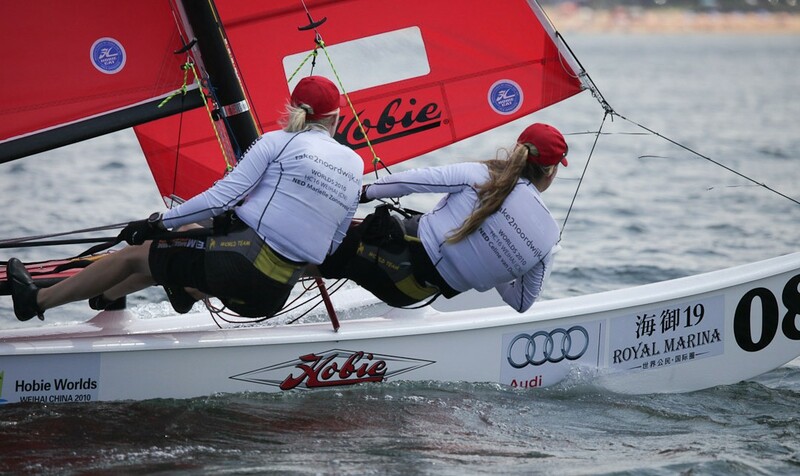 These two are preparing their way to an impressive catamaran racing career - By Lamberto Cesari: "We are very happy, it was a great season for us, after youth f18 Worlds, Hobie Wildcat Euros, German F18 champs, we are Italian F18 champions again. Four days of good and tricky races in Scauri (south Italy) with light and shifty wind. 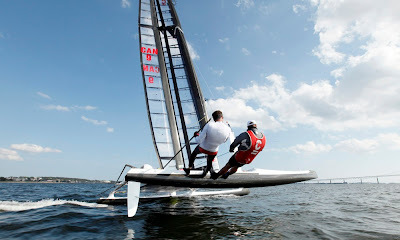 We had always good speed with our Wildcat and that made things easier. 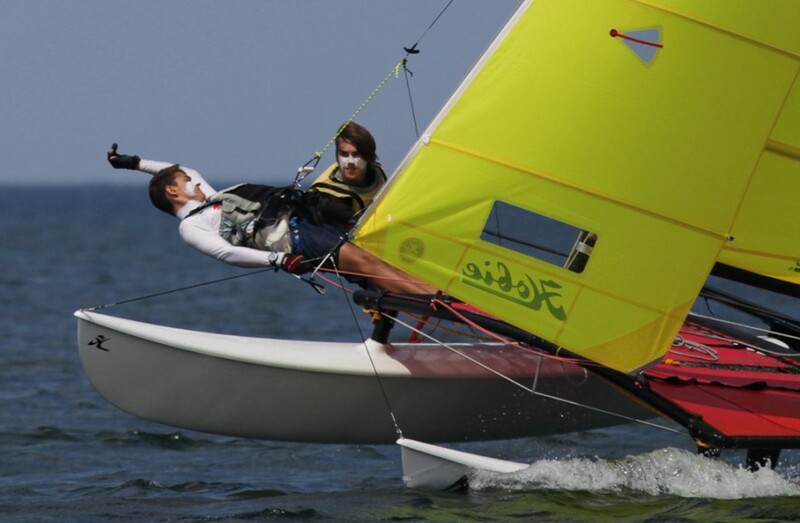 Good result even for Raphael Sicouri and Lorenzo on a Capricorn, without no training at all. 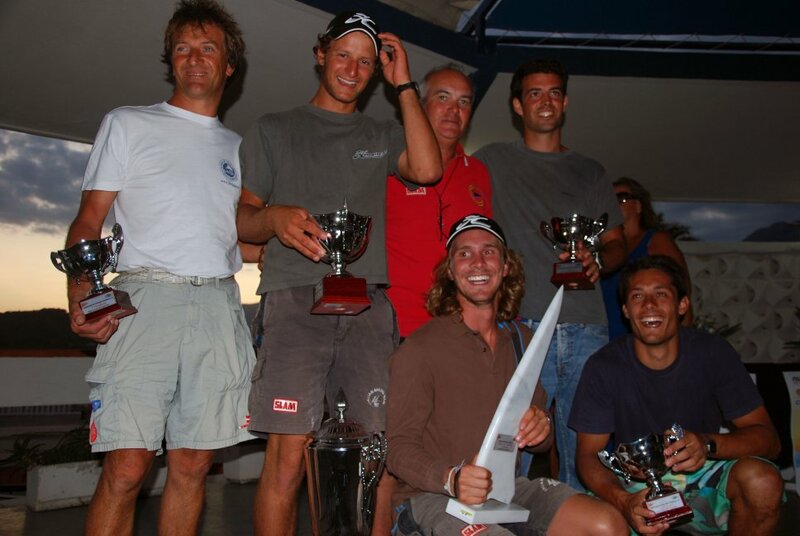 In 3rd place Daniele Saragoni and Luca Filippi on a Nacra. 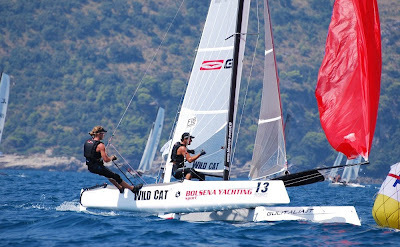 Nice to see lot of young italian catsailor growing: besides top two, in 5th place Elia Mazzucchi and Gianluca de Lorenzi, 6th Luca Ievolella and Enrico Beltrani on Wildcats, 10th Guido Pasolini, 11th Matteo Ferraglia and Lorenzo Bianchini, 12th Andrea and Matteo Viganò. 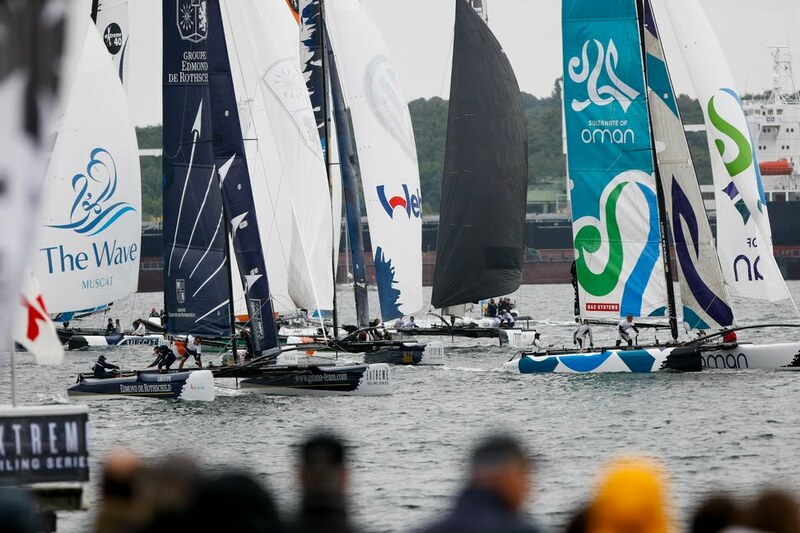 All these teams are under 25! 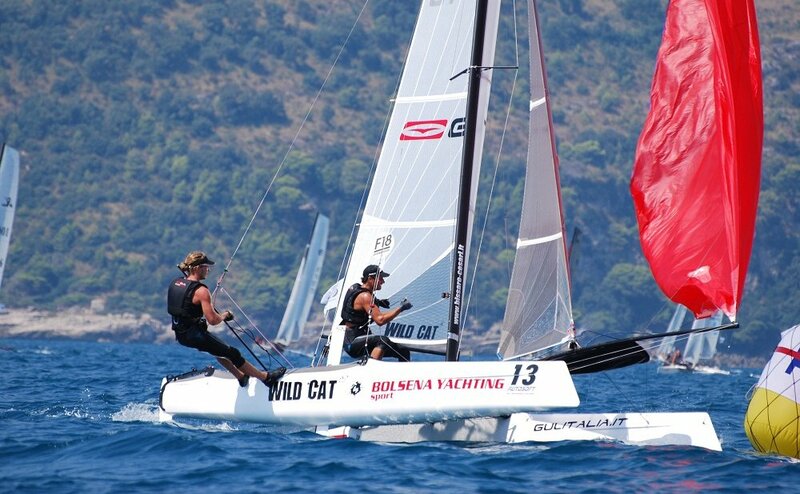 Special mention also for Giulia Bocca on 15th place, 22 years old former 420 skipper, who started with cats just 5 month ago! 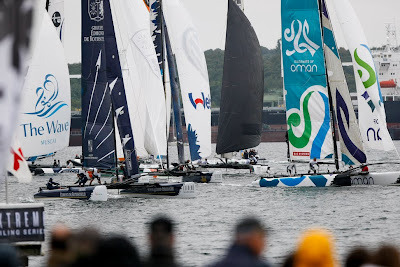 Next step?...cross the fingers and waiti for November ISAF decision!....." 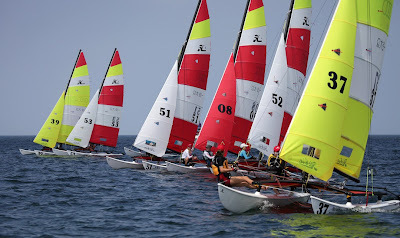 The defenders had an edge with their wing in dowind legs, but they also manage the Math Race attacks from the dream team, and sailed like the experienced champs they are. 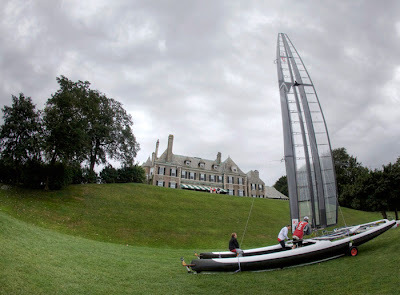 NEWPORT, RI, August 28, 2010 -- If wing technology didn’t have everyone’s attention after BMW Oracle Racing’s victorious 33rd America’s Cup, it definitely does now after the International C-Class Catamaran Championship won by Canadian Defenders Fred Eaton and Magnus Clarke, hosted at the New York Yacht Club's Harbour Court Clubhouse August 22-28. 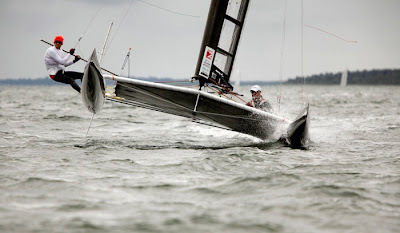 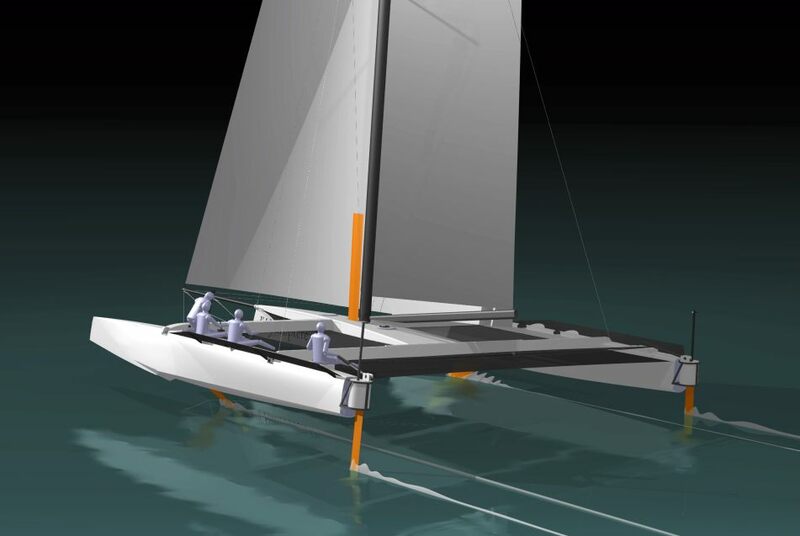 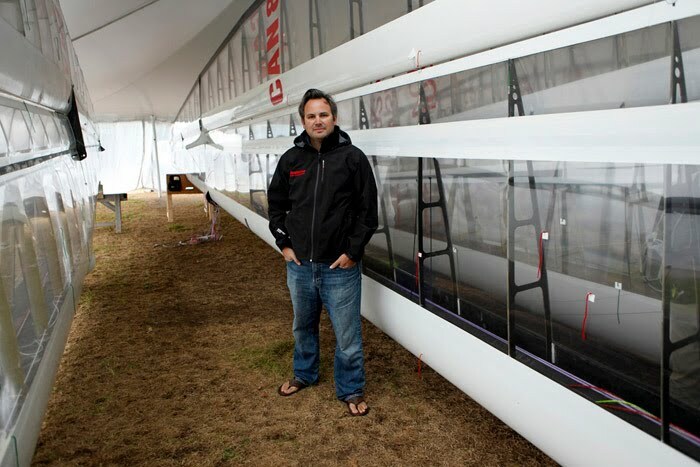 The high speeds and almost instant acceleration of cambered foils had members of America’s Cup syndicates, top designers and all sailors in awe. Canadian C Class Catamaran Team of Eaton, Clarke, Steve Killing, Rob Paterson and Rossi Milev have been along for the entire ride, one way or another. 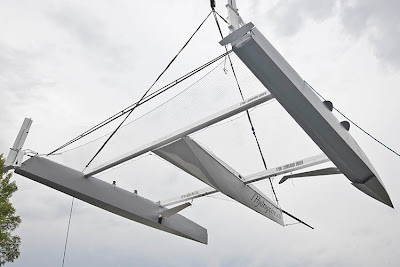 Clarke, Paterson and Milev took six months off from their C-Class program to manage wing protection for the largest wingmast ever built for a race-boat: BMW Oracle’s 223 foot (68 meter) tall wing. 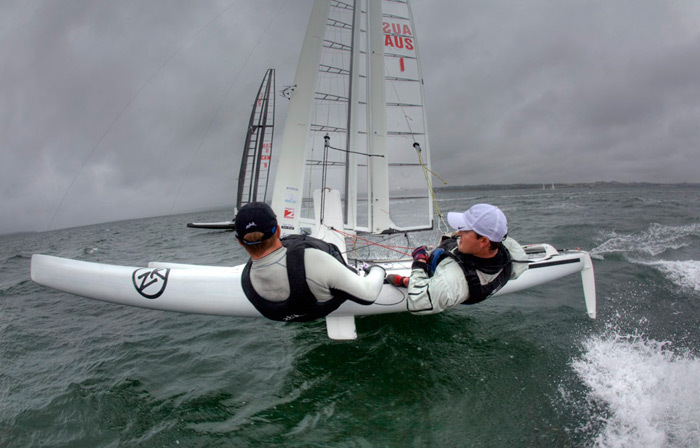 Reunited in March, their team brought four wings to the International C Class Catamaran Championship on Narragansett Bay this past week. 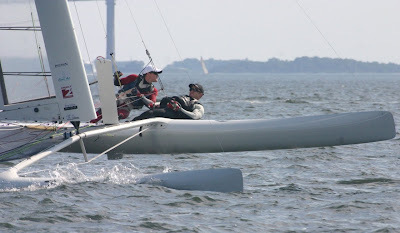 “Upwind the camber is moderate, but downwind with the flap set at 40 degrees, the wing will produce almost double the force of an equal area soft sail,” explains Killing. 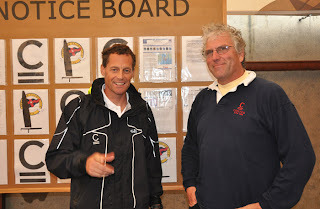 - Had a great race againts Hans Bouscholte on the F20, pace 4 pace. 14mins ahead of next F18. 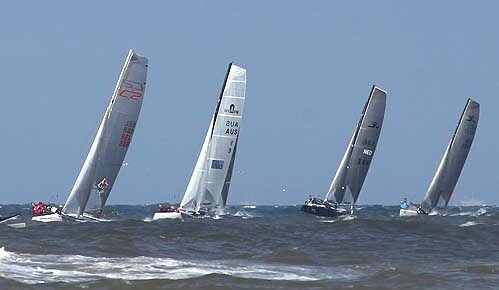 - Just arrived home from BEL Euro Cats Cup long distance, big race in 22knts & big waves. 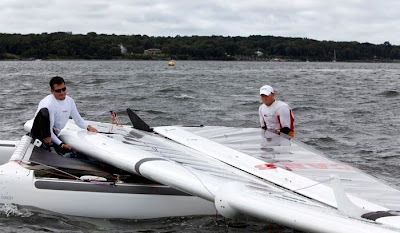 Sailing with Jeroen Van Leeuwen on the C2 to win. 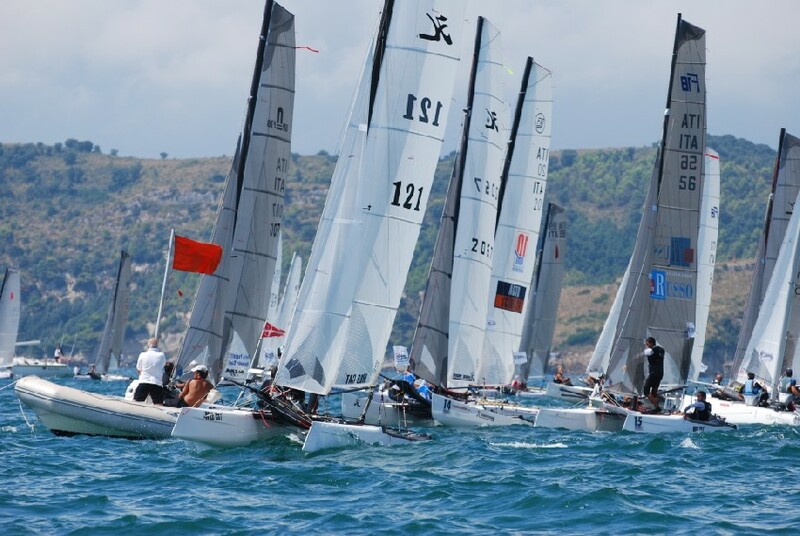 Great 3 days racing at the UK Nats this year, very hot fleet but with Styles dominating after Rob Wilson suffered a broken Mast in Race 2. 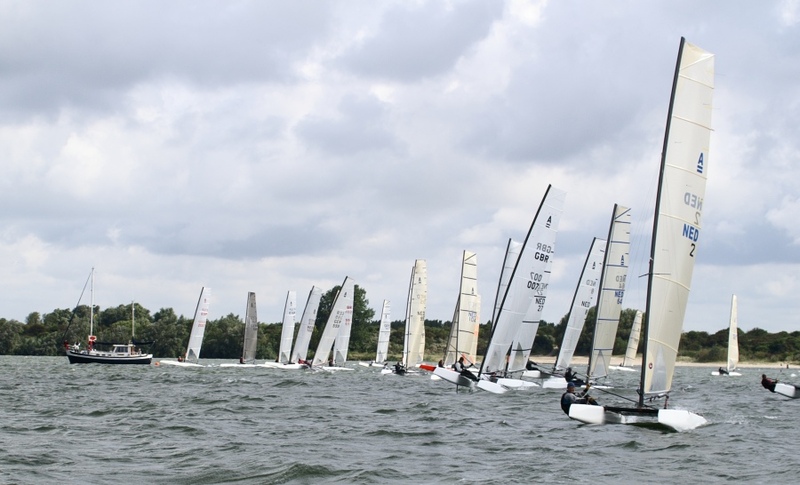 Windy on A-Class Dutch Championships in Hellevoetsluis. 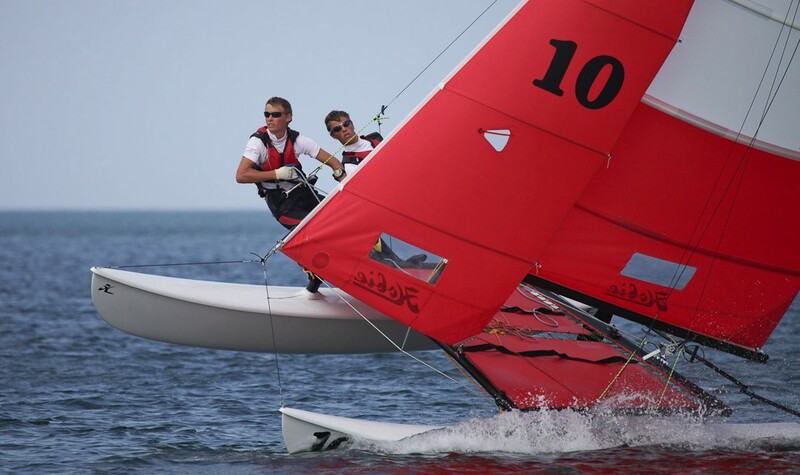 Friday, August 27 came up over 40 A-Cats at the start of the Dutch Championship, including European Champion Bob Baier, former Dutch champion Matthias Dietz, Swiss Champion Chris Field and many others. 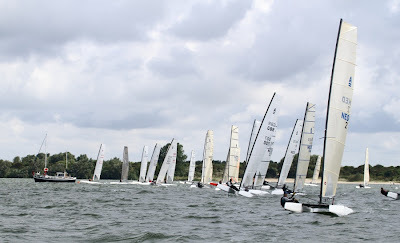 Regatta-officer Menno Vercouteren planned 4 races to sail on a windy Friday (16-24 knots), after which the provisional ranking was Chris Field on a DNA in the lead, Bob Baier on an Nikita second and third Sjoerd Hoekstra on a Tool. 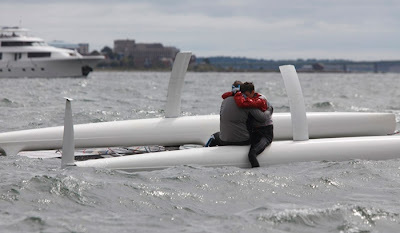 These leaders sailed all with curved boards, so straight boards belong to the past in A-class history..
Saturday morning there was possibly even more wind than Friday, so after one race was decided to return to shore. The fifth race was won by Chris Field, who is probably the new Dutch champion. 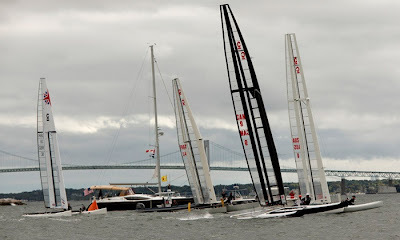 "Multihulls can´t match race..." Well just check the 1st fleet race broadcast by sailing Anarchy of the Little Americas Cup being held at the New York Yatch Club and think again. 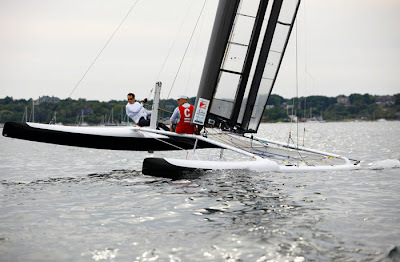 Today fleet racing for the C-Class cats, sadly Steve Clark capsized going upwind after a good start. 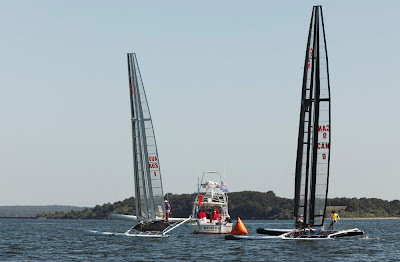 So the show was all for Ashby -Spithill with Alpha and defenders Fred Eaton-Magnus Clarke on Canaan, both boats engaged in a too close match race that was only over right at the finish line with a win for the Australians. 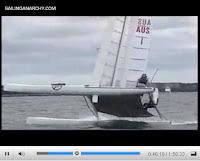 You can start watching at 44:15 for a downwind speed and extreme (almost capsized a few times) of Glenn Ashby and Jimmy Spithill at 23knots, then at 1:04 a super close finish against the defender, Canadian Fred Eaton's. 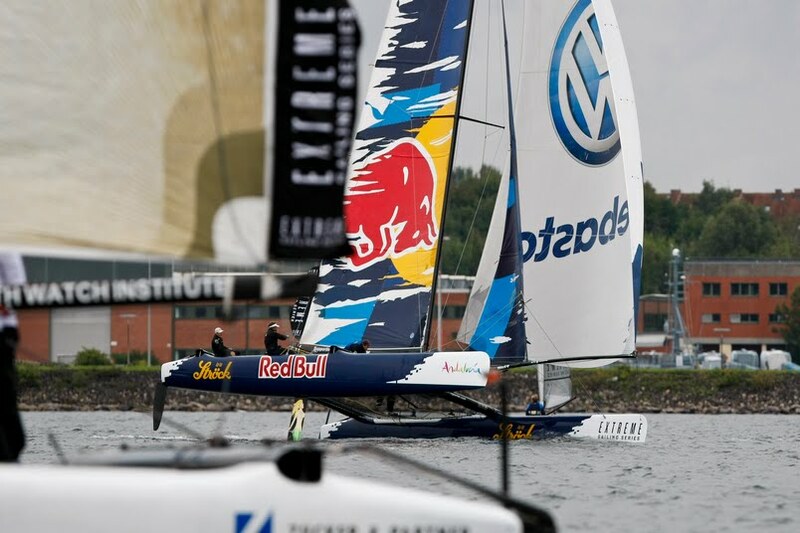 Both boats have the same platform but wings are a generation apart. Nevertheless they provided an excellent teaser for things to come in the 'big' AC. by Kees Krijger. 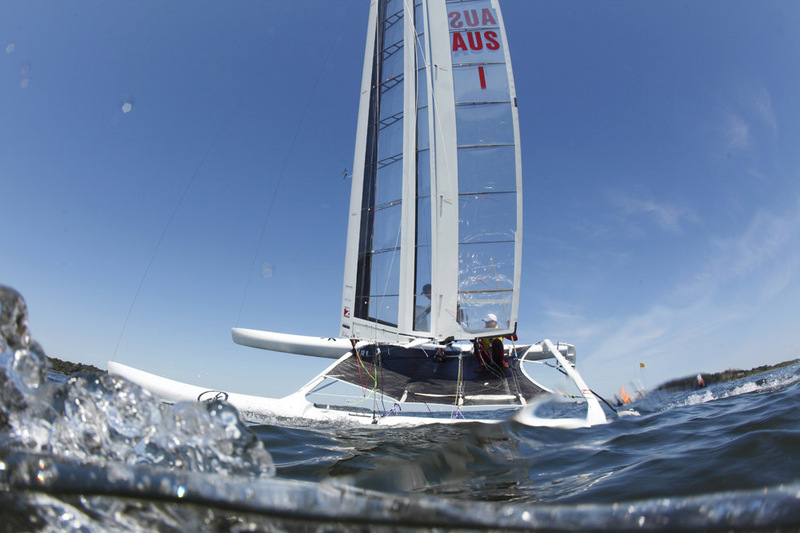 Record number of entries for Dutch Nationals A-Class Catamaran. 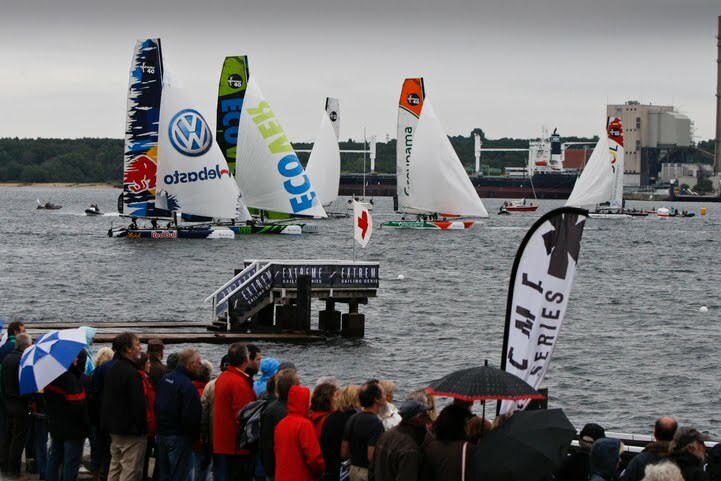 "For the first time in the history of the Dutch A-Class, there are more than 40 entries for the Dutch Championship. 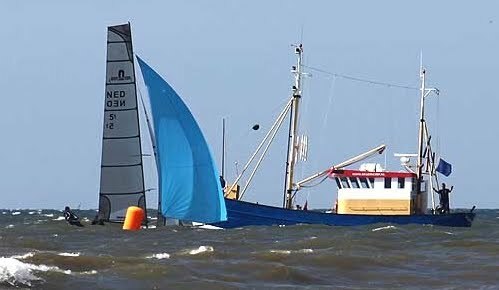 This year it will be held from 27 till August 29 at Hellevoetsluis, featuring the Swiss Meister and vice-meister at the start, respectively Chris Field and Roeland Wentholt. The current European Champion Bob Baier is expected and apparently Mischa Heemskerk will come as well. 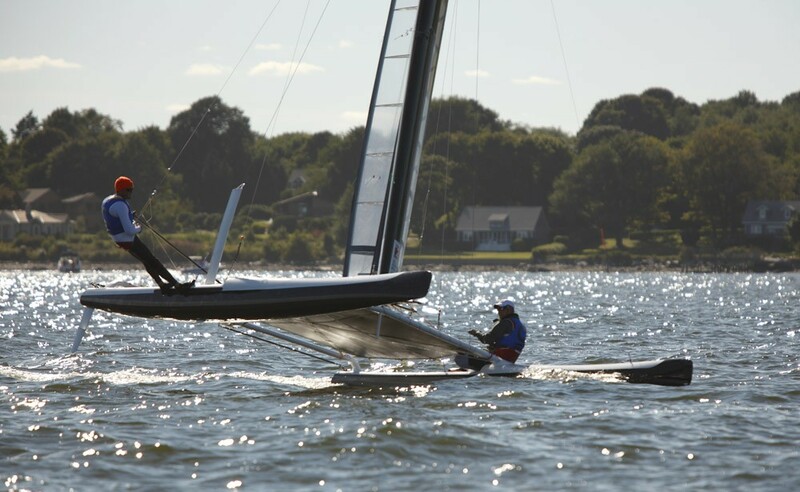 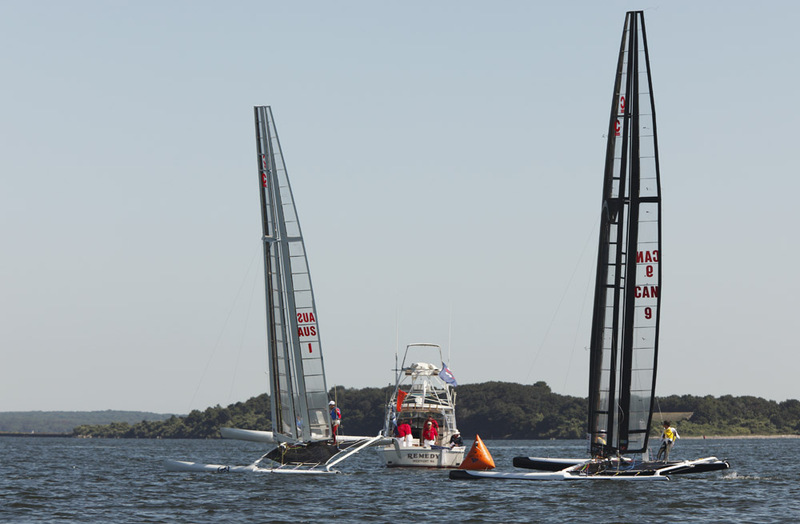 Matthias Dietz will defend his title, but the question is if he can withstand the new Dutch-catamaran DNA, which competes with seven boats in the championship"
Racing has been canceled for the day. 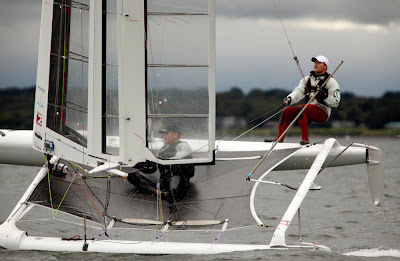 30+ knots this afternoon. 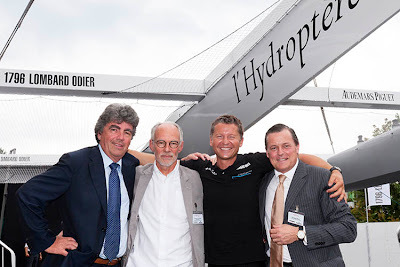 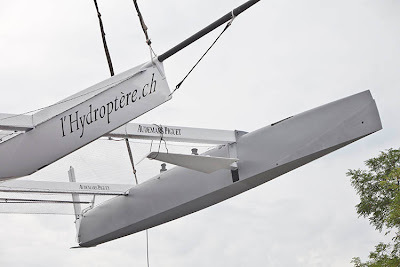 "Photo Gilles Martin-Raget / L'Hydroptere"
L'Hydroptere.ch was christened today at Decision SA in Ecublens (Switzerland). "Zandvoort NAN-REM Race was held under force 5 winds. 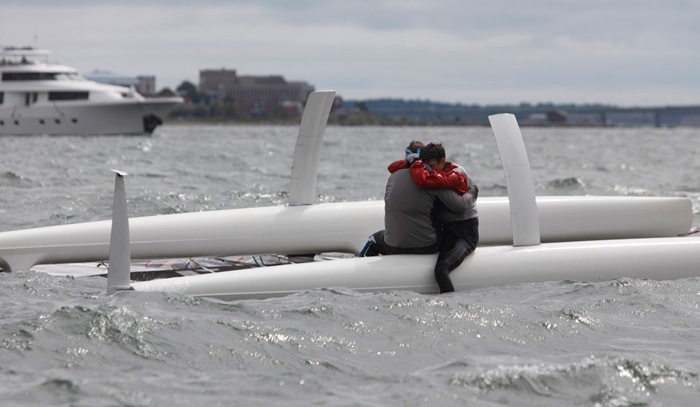 For some sailors it was a a bit too much, and some decided not to start or continue race halfway and got back. The line honors for Peter Vink and Samie Leitner on their Nacra F20 Carbon followed by Darren Bundock and Jeroen van Leeuwen that finally won on corrected time." The Nacra F20 is slowly replacing the M20 as the Long range machine. 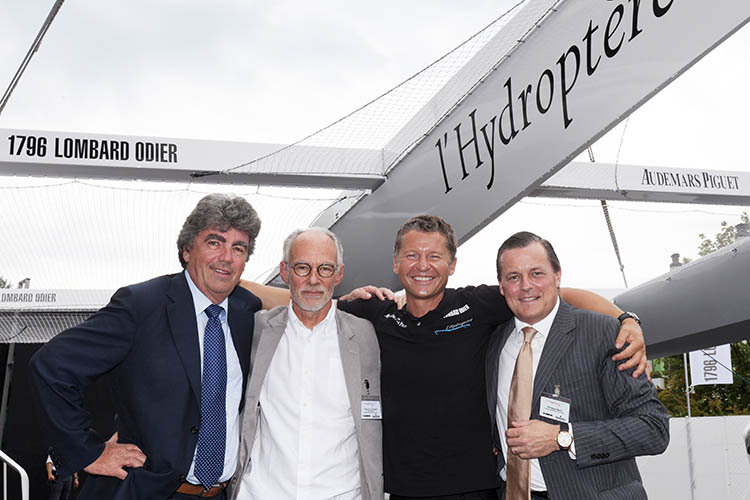 And being OD will also help to create a larger fleet that the M20 ever had, if any. 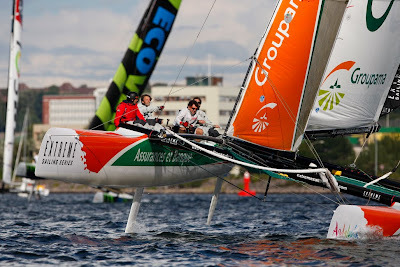 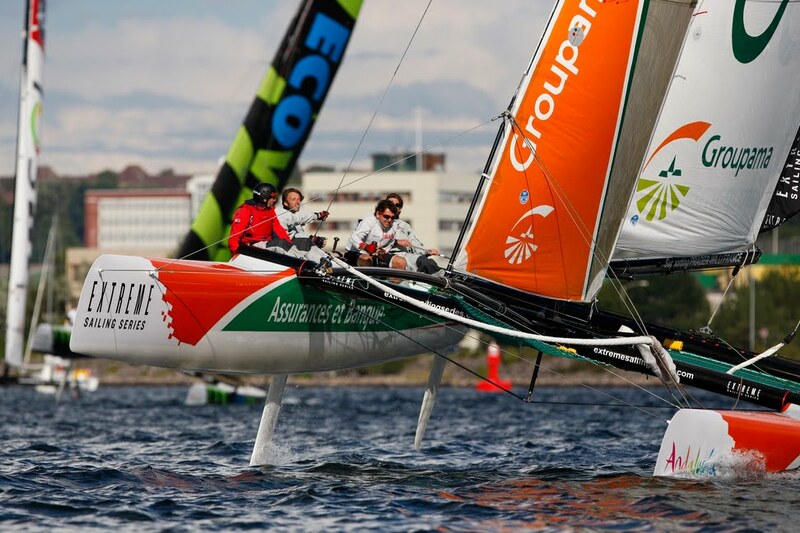 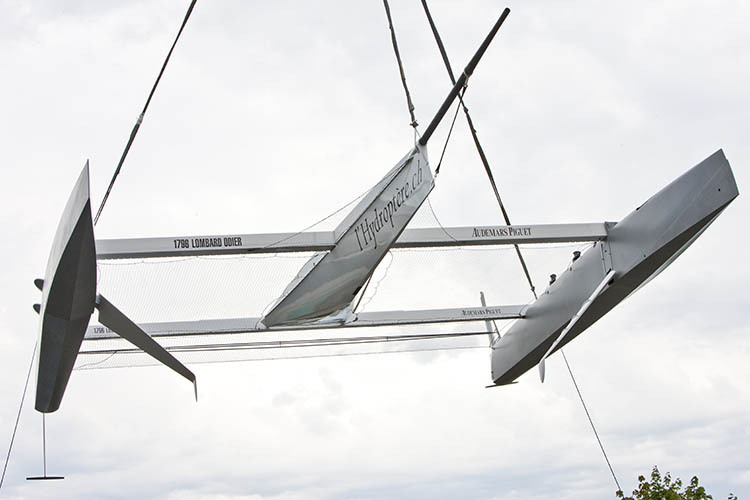 Good move for Nacra entering this niche market on the already niche Catamran racing world. 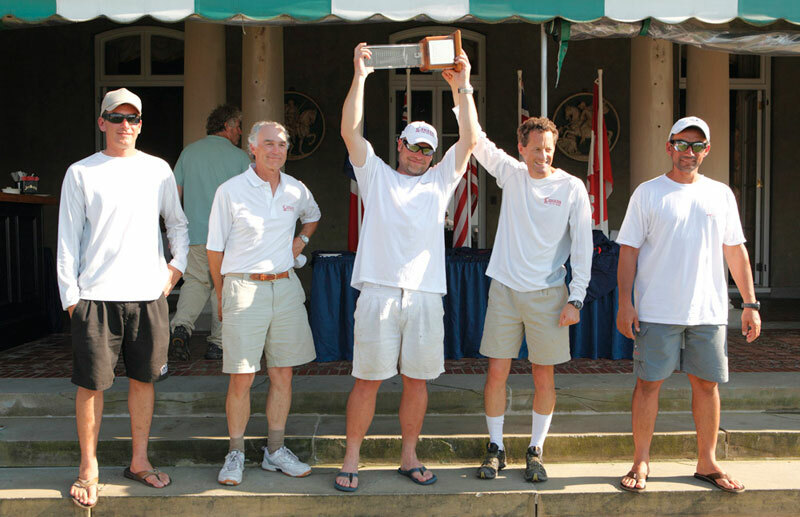 Bundock gathering momentum and hours on the new C2, winning the Long distance and dominating the course racing with four bullets.